Hustle had it roots in New York City in the early 1970s. Jeff Allen has said that, in the '60s, the Twist all but destroyed ballroom dancing. No longer did the dancer need to learn steps or even have a partner. Then the Hustle came along , and partner dancing was back. Dancers could touch. The Hustle was hugely popular. The word "hustle" makes this dance rhythm sound a lot faster and more frantic than it really is. Hustle is related to swing, and the music is a pounding disco, but the tempo is slow — closer to West-Coast Swing than to Swing or Jive. Hustle is light, smooth, and flat, a soft gliding back and forth in the slot, with the man moving gracefully out of the woman's way. There are a lot of changes of directions and turns and spins by both the woman and the man. She especially may get to feeling like a yo-yo, but a smooth and flowing yo-yo, not a jerky, bouncy one. Jive is "hot," but hustle is "cool." If you want to see what it looks like, check Saturday Night Fever (1977) out of your local library. Hustle figures mostly consist of four steps. We can do them on the beat, and four-count hustle is danced, 1, 2, 3, 4; The same figures can be danced in only three beats of music, and three-count hustle is danced &/1, 2, 3. Actually, the syncopation in three-count hustle can be danced anywhere: 1&23, 12&3, or 123&. You will ask, how do we dance three-count figures to 4/4 music? The answer is that each, three-count figure takes less than a measure. A sequence of three-count hustle will dance like this: (&/1,2,3,) (&/4;1,2,) (&/3,4;1,) (&/2,3,4;) — four figures over three measures of music. I think this works because hustle has a very regular, disco beat with no very prominent downbeat on count 1. You can feel pretty comfortable starting a figure on beat 1, 2, 3, or 4. Let me add that this timing does make hustle seem a little faster than it otherwise would be. The tempo is the same as West-Coast, but taking four steps in three beats of music means you are stepping a little faster on average. In the world of freestyle, there is considerable variability across the country: variability in the proportion of slot dancing versus rotation, in smooth vs. sharp movements, and in slower or faster tempos (within the range I've given above). Some dance &/1,2,3, and the man leads the woman back on the first step. She does a ball/change, walk, walk, the ball/change propelling her forward. Others dance 1,2,&/3, the man leading her forward on the first step. She does a walk, walk, ball/change. We have some license in dancing the hustle. And again, any of the figures described below can be danced to any of the timing options mentioned here. A final note on timing: The standard for the use of the "&" in timing is to place it after the count that is being split or syncopated. With this standard, in cha, in swing, in the syncopated foxtrot chasse, and elsewhere, we can know for sure which are the quick, half-beat steps and which are the full-beat steps. In a 123&4 measure, we know that the steps on 1, 2, and 4 are full-count, and the steps on 3 and & are half-count each. Without the standard, we have to worry, or at least consider, that the choreographer intends us to step fully on 1, 2, and 3, and to split the 4-count: &/4. Now, if you look at the punctuation that I have used on this page, you can see that hustle choreographers sometimes do not adhere to the standard usage of the &-count. I think there are two reasons for non-standard usage. The syncopated beat in hustle is a ball/change, so it is tempting, for unity or clarity, to package those two steps together as an "&/3," even though what we are really dancing is 1, 2/&, 3 (splitting the 2-ct, not the 3-ct). Especially if we are beginning our figures with the ball/change, it simplifies the cue sheet to write it &/1, 2, 3, even though we are really dancing /&; 1, 2, 3 [splitting the 4-ct of the previous measure for the "ball" and dancing the "change" on the 1-ct of this measure as a full-count step]. These points just represent my impression from reading cue sheets. When I talk to a choreographer about this, I may have to revise my thinking. In your own dancing, you will feel the music and dance to the music, and whether the fine print on the cue sheet says 1, 2/&, 3, or 1, 2, &/3, won't matter too much. Cal Pozo (in his book Let's Dance) describes a Basic Time Step as rock bk L (W bk R)/rec R (W rec L) [this is the ball/change], close L, in place R, [&123] -- very like the push break described below. As a "club" dance, figure names are not well standardized. Also called Changing Places and can be danced in low butterfly: rock back L (W bk R)/fwd R (W fwd L) beginning a 1/2 RF turn [a turning ball/change], sd & bk L completing the turn, close R to L, [&/1, 2, 3,]. Notice that we are exactly changing places in the slot. Often the arms are swung out to a wider butterfly on the ball/change and brought back in on the 2, 3. A Break is a figure that begins in any position and ends in that same position. In our L-shaped, closed position, man facing wall and woman facing line, lead hands joined, trail arms in closed position, the man steps side left and recovers, releasing his right hand. The woman rocks back right and steps forward left, turning left face. This has a slingshot feel to it. He crosses left in front of right, turns left face 1/4 to face line, and steps back. She continues turning, steps side and back right, and steps back left to face reverse. We end in butterfly line. With timing indicated: sd L she bk R/recR she rec L, XLIF trng LF 1/4 to LOD she sd & bk R trng LF 1/2, bk R she bk L, The release is always done from the hustle closed position, but your facing direction may vary. Second, you may release to other ending positions than butterfly, such as left open facing or left open position. A nice, basic sequence is push break twice, close, release, close, release, and repeat. A Pass is a figure that begins in one facing position and ends in another facing position. In low butterfly, rock apart on the lead foot, swinging the arms away from the body. This arm movement prevents you from rocking apart too far. The man recovers, crossing right in front of left to get out of the woman's slot, and the woman recovers L. The man steps forward L beginning a RF turn and passing his partner's right side as she steps fwd R also beginning a RF turn. On the last step, he continues to turn XRIF of L, and she continues to turn and steps back L to end in butterfly having turned 1/2. In left open facing position, rock apart, step forward XRIF of L (woman fwd L) raising lead hands to lead a reverse underarm turn. Step fwd L beginning RF turn (woman fwd R turning LF), and XRIF of L continuing to turn (woman continuing to turn and step back L). End in left open facing position having turned 1/2. Just another name for the inside underarm pass and an example of alternative timing -- 3-count rather than 4-count. In left open facing position, rock apart, step forward XRIF of L raising lead hands (woman steps forward L). On beat 3, step forward L beginning to turn LF under lead arm (woman steps forward R beginning RF turn). Finally, continue the turn and step back R (woman back L) to left open facing position having turned 1/2. In left open facing position, line, the man rocks back a small step and crosses right in front of left, stepping out of the woman's way. He raises his free right arm and will sweep it forward and down as he passes her on bead 2. She rocks back on her right and steps forward left. On beat 2, he steps forward left to her right side, turns left face, and releases her right hand with his left and takes it with his right at his right hip. She steps forward right and turns right face. At this point, she is facing his back, and both face center. On beat 3, he continues turning left face and steps back right, changing her right hand back to his left. She continues turning right face and steps back left to end in left open facing position, reverse. Each turned 1/2. Remember the syncopated timing: bk L she bk R/XRIF she fwd L, fwd L trning LF she fwd R trng RF, bk R she bk L, In L-closed wall, release, hand change pass twice, and close back to wall. In left open facing position, rock apart, step fwd XRIF of L as woman steps fwd L and with lead hand lead woman to begin a LF roll. Release lead hands and step fwd L beginning a RF turn as woman steps fwd R and begins a LF turn. Finally, finish the 1/2 turn and step side R, woman side L, to end in left open position. I suspect that the Roll Pass could end in other ending positions with appropriate modifications of the last step. The essential features seem to be the rock apart, man roll RF and woman LF, as man passes womans right side. As in all these "passes," begin by rocking apart and then stepping forward, the man crossing R in front of L to get out of the slot. The man then steps fwd L turning LF and the woman steps fwd R. The man continues to turn and steps side and back R and the woman steps forward L turning 1/2 RF. You are facing each other, as a couple having turned 1/2. In the second measure, the man continues to turn LF and steps side and forward L and the woman steps fwd R, step fwd and across R turning and woman steps fwd L turning 1/2 RF, continue turning step side and back L woman close R, and then close R woman close L having completed a full turn in all. In essence, the man rolls LF around the woman as she does her usual back and forth in her slot. Her fifth step is an unusual forward step, which keeps her more compact and less likely to be mowed down by the rolling man (a loose cannon). An option suggested by the Worlocks has the man raising his R arm on step 2, then L arm on step 4, sort of whirling like a windmill or soaring airplane, then R up and L down on step 6, and L up and R down on step 8. The use of this option makes it still more important for the woman to stay compact and out of his frantic way. In left open facing position, facing line of dance, the man rocks back a small step and crosses right in front of left to her right side and taking trail hands in a low butterfly banjo position, still facing line. She rocks back and recovers. Wheel right face one full turn, fwd, fwd; fwd, fwd, fwd, fwd; On the last step, you may move apart to banjo or to left open facing again. Push break twice and close. In a facing position, no hands joined, point L foot to the side (woman points R). The knee is turned inward. The L hip is up. The right hand is at the right hip, and the L arm is across the body with the index finger pointed down to the right. Look in the direction of the pointed finger. All of this is to set up the Travolta action. On beat 1, use a circular hip rotation to pop your R hip out and turn L foot (woman R) to a press line. bring the L arm straight up to the L with pointed index finger, and look in the direction of the pointed finger. On beat 2, bring the lead arm down to the R sd (woman L sd) with lead ft and head following the motion. On beat 3, bring lead arm up again with the lead ft and head following the motion. On beat 4, bring the lead arm back down to the right sd again with foot and head following the motion. You are pointing up to the left, then down to the right, and repeating. There is no change of weight during the figure. 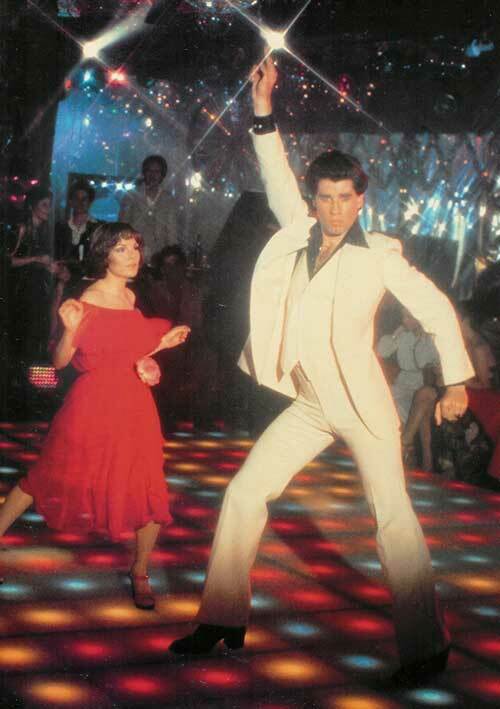 Again, watch Saturday Night Fever to see what John Travolta can do. May be danced from other facing directions. Notice that here the ball/change is written across beats: the "ball" is danced on the & of 2 and the "change" is danced on 3 (refer to discussion at top of page). Beginning with this figure, I offer some 6-count figures that I have not seen in round dancing. These are taken from Earl Atkinson's booklet (see sources page, link at bottom). Compare this one to the right side pass, described in 4-count above. This is one measure of the pass half turn right and then wrap in 2 to sweetheart position fcg LOD. The common exit from the wrap around is an arch turn right. She unwinds RF and returns to her original position. May be done with RF turn (W LF).